Indian festivals and no desserts? Not possible. Dessert is a must to celebrate any festival . But nowadays, because of our hectic schedule, we get very less time to exercise. So, we have to keep control on what we eat. And especially if you are on sugar free diet, then you have to think twice. But how to prepare Sugar Free Dessert? There are many sugar substitutes, available in market nowadays but they have side effects too. What if you can manage the desserts without any added sugar and with health benefits too? Today, on the occasion of Gudi Padwa, I wanted to prepare some healthy food as a start of our Hindi New year. To begin with, I looked for some sugar free recipes on internet and came across so many options. 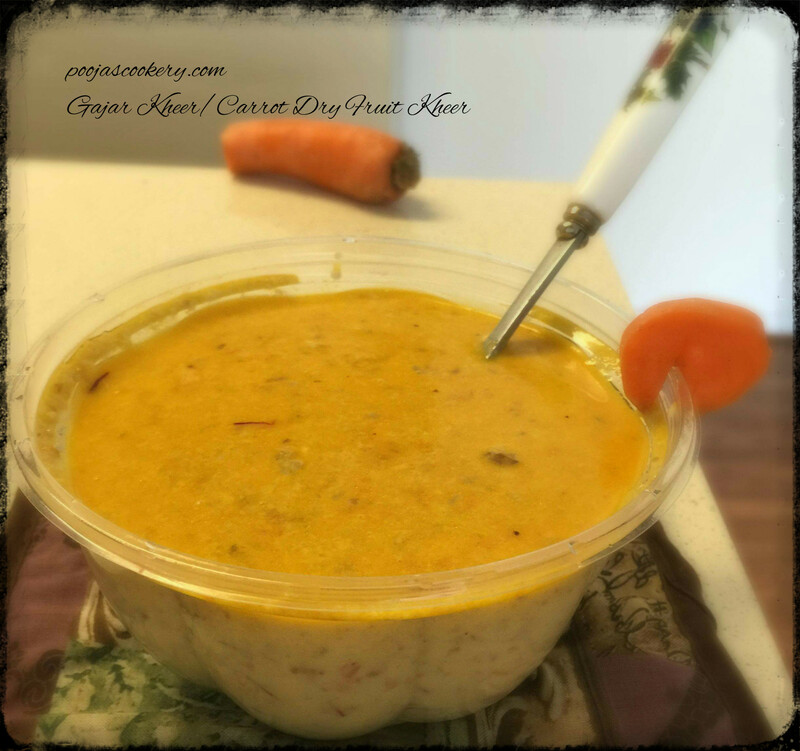 I wanted to make some healthy kheer or payasam , which is also yummy and tasty. So substituted my sugar with dates. Now you will say that , this looks like some diabetic dessert. But you are wrong. This dessert really tastes yum and you should give it to your kids too, as dates have lots of iron. In my recipe, I have soaked around 8-10 dates and some nuts in warm milk for about 15 minutes and then put them in the blender to make paste. Don’t have to fry or saute this paste. Just drop it in the prepared thick milk, mix and serve. And oh yes! you can always substitute full fat milk with almond milk. 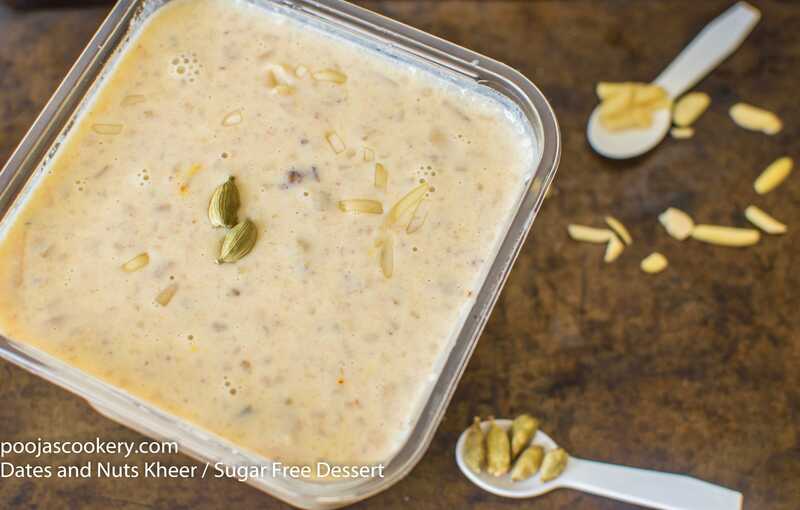 So let us see how to make this sugar free dates dry fruit kheer. Soak dates , almonds and walnuts in 1/2 cup warm milk for about 15 minutes. Grind them along with milk to fine paste. While grinding , if you need extra milk, use a little extra milk, but don’t make it runny. Meantime, Add a tablespoon of ghee in a medium saucepan kept on medium heat and once it melts, add few raisins and almonds. Fry for few seconds and remove on a plate. In the same saucepan, boil 3 cups of milk on high heat. Once it comes to rolling boil, lower the heat. Keep it on low and add saffron strands. Mix and let it simmer on low heat for 5 minutes. Switch off the heat and add fried nuts and raisin along with the prepared dates and nuts paste to it. Add cardamom powder. 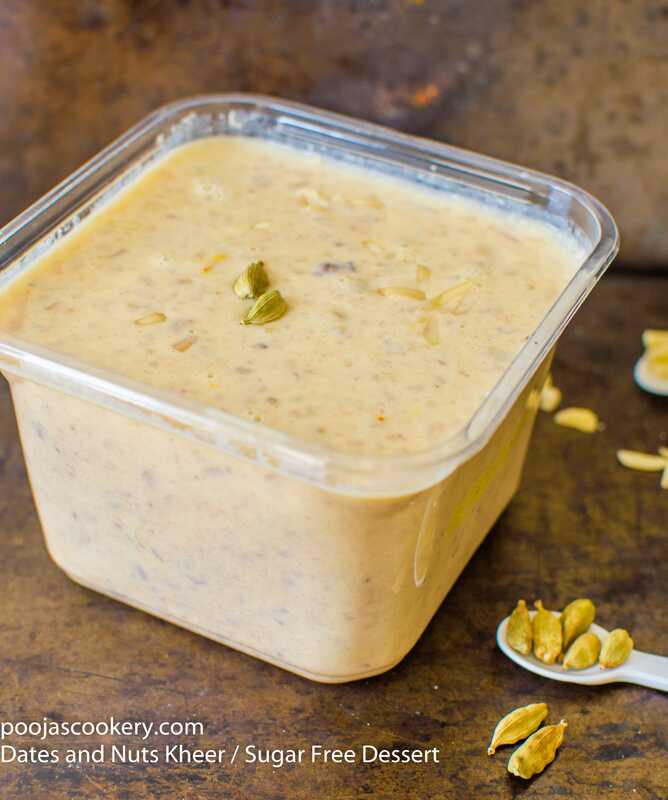 If you like it chilled, then refrigerate after it cools down completely and then serve, otherwise enjoy this delicious and healthy dates and nuts kheer warm. Soak dates ,almonds and walnuts in 1/2 cup warm milk for about 15 minutes. Grind them along with milk to fine paste. While grinding , if you need extra milk, use a little extra milk, but don't make it runny. i love the step by step photos! i can't handle milk or cream. but i grew up with homemade kheer, so my recipe is dairy free, and and has no added sugars, like yours! just fruit! Oh ok . Nice . OMG! Pooja I want to eat the whole thing. The cardamom and dates are tempting me. Thanks Carla. I make this often. What a wonderful recipe to start out a healthy new year! I love that you are using dates to provide the sweetness in the recipe. That's great way to satisfy you sweet tooth without sugar. I know . I try to use dates in most of my desserts. yummy, love it. thanks for sharing us. Do we need to reduce the milk to half for a thicker consistency or the dates and nuts mix will do the job? No need to reduce milk. Nuts will do the job.